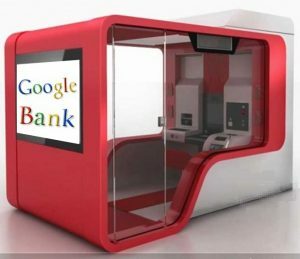 What would happen if Google was to found a “Google Bank”? Most likely the music industry would have never dreamt of Apple becoming their biggest competitor. In a similar vein established mail order businesses had never imagined that the auction house Ebay and the book store Amazon would suddenly pull the rug from under their feet. And the camera manufacturers of this world carefully watched each other’s every move but obviously lost sight of the digital competition. For Kodak this ended deadly. But how about today’s banks? What would happen if an industry outsider would enter the banking industry and would pose a serious competition for the established players? For instance, what would happen if Google would decide to setup a bank? First of all it should be noted that the necessary cash is available. With approximately 60 billion US Dollar Google has a pile of cash at its disposal that is waiting to be assigned to a specified use. The entry hurdle cash is thus negligible. One could even go as far to say that Google could easily absorb a total write-off in case the banking venture should fail. Moreover, cost advantages may arise through the technology leadership that Google possesses. Incumbent banks regularly struggle with IT legacy systems that had often been built in the eighties of the previous century. These core banking systems had not only been developed in programming languages which are hardly known these days any longer, but they are based on a process oriented approach which is antiquated given today’s object oriented program codes. Merely keeping those systems alive already eats up a fair share of the entire IT budget of many banks. Google would not have these legacy problems. Google could build a new bank based on the latest IT technology on a green field or – to be more precise – in a green cloud. But does Google have the necessary reputation to do banking? Conventional wisdom has it that banks should be serious, conservative, maybe even a little bit outmoded. At first glance this notion does not sit well with a playful service provider whose corporate identity was coined by the colours of Lego bricks and that grew large in the Internet. At closer inspection, however, one can observe that already today clients entrust Google with almost any information. The trust in Google appears to be boundless as far was data is concerned. Why should that be different in money matters? But what about Google’s potential clients? Who would entrust a Google Bank with his or her money? In this context it must be noted that as of today Google has already more than 400 million clients with user accounts that source various products and services from Google, from email accounts over translation or navigation services to hardware such as the Google tablet. The list is almost open-ended. If only a fraction of these clients would become clients of a Google Bank it would mean millions. To put it at its simplest the business model of Google consists of collecting, condensing and editing data in a user-friendly fashion. Google has honed this model to perfection. Should Google now decide to offer banking services we could also expect to see this type of sophistication in banking. As an extreme case Google could for example scan the mail box of a client (as is already happening today). If there are any indications that the client may want to purchase a house, Google could proactively offer a mortgage to this client. Google has the potential to reveal client needs and to make corresponding offers even before the client is clear on his or her need himself or herself. Last but not least Google has an outstanding reputation as an employer. When it comes to winning employees for a new Google Bank, Google could easily keep up with incumbent banks – at least as far as the under 35 year olds are concerned. As the banking industry’s neophyte Google could differentiate itself from the alleged causers of the financial crisis. It is safe to assume that Google could fight the war for talent from a vantage point. If the preconditions are so favorable for Google why has Google then not long entered the banking industry? A plausible explanation could be that Google still considers the banking sector as too unattractive. But this could change soon as Google has already made first steps towards banking with the Google Wallet and by obtaining a license as an Electronic Money Institution. This leaves incumbent banks with two options in the meantime: one could be entering a partnership with Google and forming an alliance with the technology giant. The second option would be to swiftly whip finances into shape, to polish up the image of the bank, to increase the customer base, to improve client service and to enhance the relationship with the employees – quite simply to be geared to Google in these matters. Hence, when looking at the own position in the banking industry, it could be worthwhile to get one’s bearings not solely by looking at the other competitors in the banking business. Looking at the banking world over the rim of one’s tea-cup could thus be a valuable exercise. This is the English translation of a German post that was published on the Swiss financial blog ‘Inside Paradeplatz’ on 04 March 2015. Due to numerous feedback on the German post, manifold requests of non-German speakers to translate the text, but also due to the fact that I attended some utmost inspiring presentations by Patrick Warnking and Sandra Emme of Google Switzerland in the meantime, I decided to also publish the English version of this post. Author schueffelPosted on May 28, 2016 February 13, 2017 Categories Banking, FintechTags banking, financial services, future, googleLeave a comment on What would happen if Google was to found a “Google Bank”?